VW is a major football sponsor and owns the VfL Wolfsburg team. FRANKFURT: German auto giant Volkswagen said Friday it will cancel the late shift at its main plant in Wolfsburg so workers can watch the quarter-final World Cup football match between Germany and France. "We've struck a deal to shut down the late shift, which runs from 2:00 pm to 10:00 pm (1200-2000 GMT), a spokesman for the sites works council told AFP, adding that some 4,000 workers would therefore be able to watch the game. The hours would be docked from their monthly working time accounts, he explained. A similar dispensation shortening the afternoon and late shifts was awarded for the semi-quarter match between Germany and Algeria on Monday. VW is a major football sponsor and owns the VfL Wolfsburg team, which plays in the Bundesliga national championships. 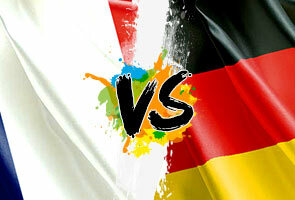 The match between Germany and France kicks off at 1600 GMT in Rio de Janeiro's Maracana stadium.